Generally cloudy. A stray shower or thunderstorm is possible. High 73F. Winds S at 10 to 15 mph..
Thunderstorms this evening, then cloudy with rain likely overnight. Gusty winds and small hail are possible. Low 44F. SW winds shifting to N at 10 to 15 mph. Chance of rain 100%. Lester Blase, Waupun, passed away Wednesday, Feb. 6, 2019, at 91. Lester was born Dec. 28, 1927, in Waupun, the son of Robert and Grace Van Egtern Blase. 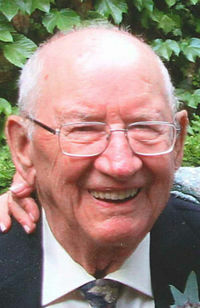 Lester attended Willow Creek Grade School and graduated from Brandon High School in 1945. Les was a veteran of the United States Navy Air Corps and served from 1945-1947 in World War II. On June 21, 1952, he married Lois Schmidt at Immanuel Lutheran Church in Waupun. The couple resided in Waupun all their married lives. Les was employed as a carpenter by Home Contractors in Waupun for 20 years. He was then a union carpenter working out of Local Union 910 and later Milwaukee, where he retired in 1985. He helped build his family home along with others in the Waupun neighborhood. Les was very active with Waupun Little League for several years. He was an avid hunter and fisherman and enjoyed camping. He was a member of Immanuel Lutheran Church in Waupun. Lester is survived by his wife, Lois Blase of Waupun; their three children: Cheryl (David) Kryshak of Palm Desert, California, Dr. Susan Blase and her husband, Chris Sommers of Costa Mesa, California, and Jeff (Mary) Blase of Vernon Hills, Illionois; six grandchildren: Andrew (Adria) Kryshak, Elizabeth Kryshak, Sarah and Madison Sommers, and Erin and Lily Blase; a brother, Roger Blase of Waupun; a sister-in-law, Bernice Krueger; and nieces and nephews. Funeral services for Lester Blase will be held Tuesday, Feb. 12, at 11 a.m. at Immanuel Lutheran Church in Waupun with Rev. Jeff Nicla officiating. Burial will follow at Highland Memory Gardens in the town of Trenton where American Legion Post 210 of Waupun will perform military honors. Friends and relatives may call on the family at the church on Tuesday from 9:30 a.m. until the time of service. Werner-Harmsen Funeral Home of Waupun and staff are serving the family. Visit wernerharmsenfuneralhome.com for more information and to send condolences.